Spiced Crabapple Jelly – Dig Delve – An online magazine about gardens, landscape, growing & making. At this time of year there is always more fruit than it is possible to process and preserve. This has been a small torture in previous years but, gradually, we are coming to terms with the necessary waste and, whenever possible, we give fruit away to neighbours or bring baskets of windfalls back to the office in London. As the orchard grows in stature we plan to offer the pickings that we can’t use to local restaurants, and start juicing on a more regular basis. Every autumn I make a number of preserves, both to stock the winter pantry and to provide Christmas presents for friends and neighbours. Last year it was bottles of pumpkin ketchup and jars of wild apple and rosemary jelly, the year before damson cheese and homemade crème de cassis and crème de mûres. This year the crabapples have been their most productive since they were planted 6 years ago, groaning under the weight of bright red fruits, and I couldn’t countenance leaving them all for the birds. I have always been a little daunted by the prospect of harvesting crabapples and it does take longer to harvest enough compared to regular apples. However, with a sharp pair of secateurs to hand, it only took me 30 minutes to collect 3 kilos, which is plenty for a good batch of jelly, producing plenty to give away. 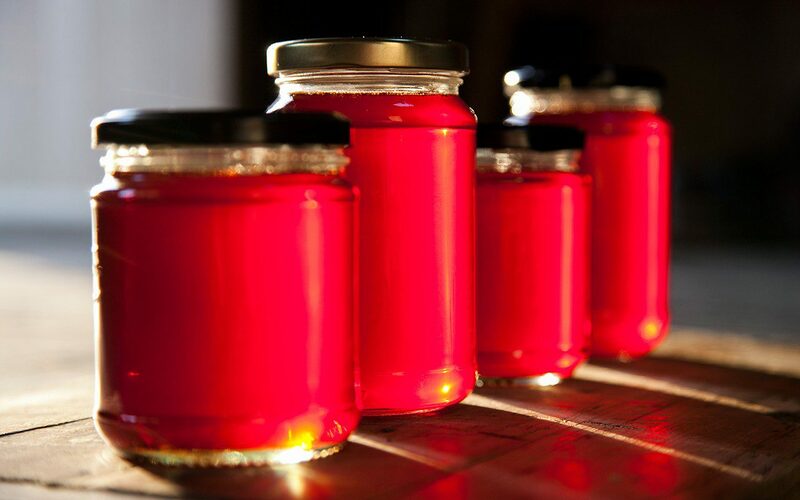 It is difficult to give exact quantities for jellies, as the amount of sugar required is completely dependent on the amount of juice you can extract. The 3 kilos of fruit I collected produced about 6 kilos of jelly. 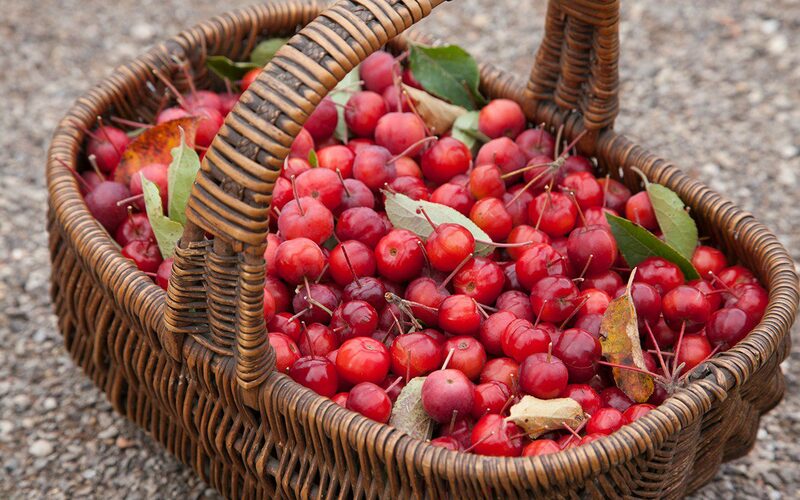 Due to their high pectin content crabapples (and wild apples) make the best base fruit for other types of foraged jellies, as long as crabapples make up no less than half the combined weight of your fruit. You can mix them with brambles, haws, sorbs, sloes, rosehips and elderberries to make a mixed hedgerow jelly, or with any of these other fruits alone to produce a jelly that tastes more purely of the partner ingredient. 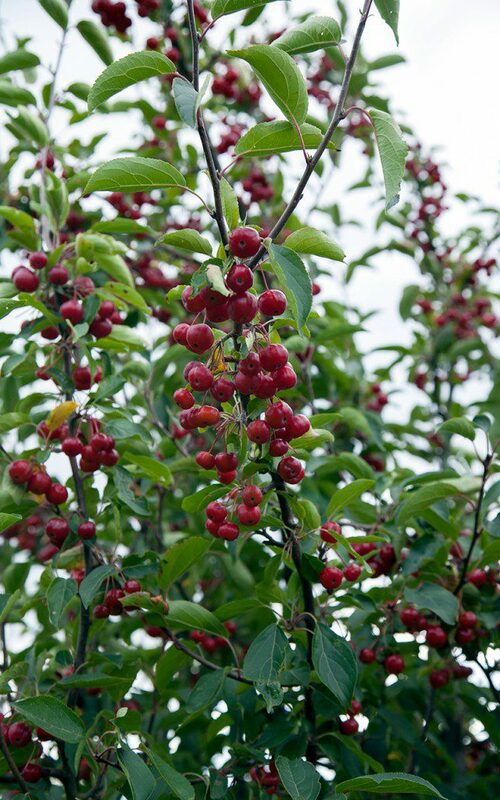 I used the fruit of Malus hupehensis, which produces a vibrant red jelly. Less strongly coloured fruit, such as the yellow Malus ‘Evereste’, produce an amber jelly. Wash the fruit and chop coarsely. This can be done in a food processor. Put into a preserving pan and just cover with water. Add one bay leaf and 3 cloves per kilo of fruit. Put on a low heat and slowly bring to a simmer. Cook gently until the fruit is soft and pulpy. Allow the fruit pulp to cool slightly before pouring into a scalded muslin jelly bag. Allow to strain for at least 6 hours, or overnight. Do not squeeze the pulp or the jelly will be cloudy. Measure the juice and put into a clean preserving pan and heat gently. Once the juice is hot add 450g of sugar for every 600ml of juice. Stir until the sugar is dissolved, then bring to the boil, skimming off the scum that appears on the surface. Allow to boil for 10 minutes without stirring. While this is happening put a small plate into the freezer. After 10 minutes of boiling test the jelly for setting by dropping a little of it onto the cold plate and returning to the fridge for a minute. The jelly is set when the surface wrinkles when pushed with a finger. If it isn’t set after 10 minutes then return to the boil and re-test every 3-5 minutes. Once setting point has been reached allow the jelly to settle off the heat for a couple of minutes. Reskim again to remove all scum from the surface before pouring the jelly into hot, sterilised jam jars. Cover with waxed paper and seal with clean lids.